As I was building the first one of eight, I decided I would document the "pinning" of the model (wings) in case of you were thinking about building eight of these yourself. I'm starting with this guy already cleaned of all his mold lines, the base just about finished and the legs already mounted to the base. And... you can see that I already have the pins mounted in his upper torso. All in all, he's pinned at the wings, in both arms, in the torso, to the base and his whip too. For this post, I'm just covering the wings since it's easier for me to be quite honest. When I pin something (especially like this) I use a heavy duty floral wire to make the joint. When I drill my holes, I drill them slightly larger than the diameter of the wire as well. Why? Added stability and somehow I feel like it creates a better joint. Probably all psychological, but I feel good about it. After doing whatever clean up I need to do to get the joint as snug as possible, I'll dry fit it to make sure it's the best fit possible. Then I actually pin the joint. First I add a drop of superglue in the hole. 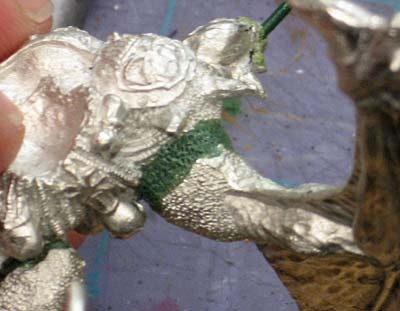 Then I add a tiny bit of greenstuff to the hole. Not a ton of it, just enough to fill it. 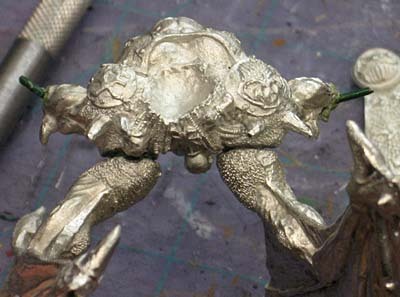 You have to work fast because it seems like the greenstuff reacts with the superglue and hardens quicker than normal. Then it's as simple as putting the pieces together. 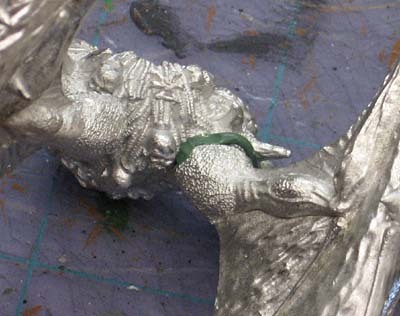 If you have the right amount of greenstuff, it will fill the void between the pin and the drilled hole and just about ooze out of the joint between the two pieces. If it does ooze out too much, you can just cut away any excess. 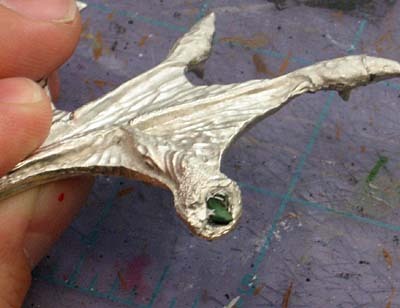 It's too hard to sculpt in place because it's mixed with superglue and you can't get it smooth. If I back up here, the pins you see in the arms (in the pic above) are done the same way. 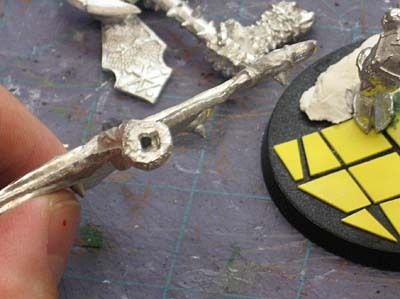 Drill hole, add superglue, add greenstuff, insert pin and remove excess greenstuff. If you need to, cut away any excess pin length you have and let it cure before moving on. You can also see that the wings do not fit perfectly to the torso. That's really strange, I've never had that happen with a GW model. Strange. A thin roll of greenstuff laid along the joint is all it takes. Just press what you can into the gap, smooth out the edges to make the transition as smooth as possible and texture appropriately. If you get it close enough, by the time you paint it, you'll never even know there was a joint there. In this case, I used the tip of my X-Acto blade and stippled the texture on to match what was already there. Simple as that. The arms are done the same way except the final texture around the joint is smooth to match the texture of the surrounding skin at his elbow. Mr. Esty: Yep... 8. 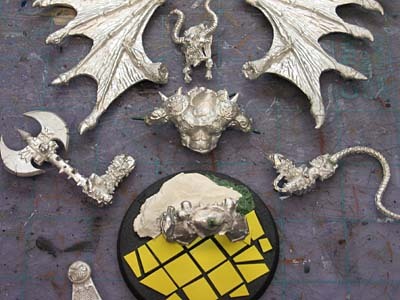 It's for the Bloodthirster Bloodbath Apocalypse formation.